But the 46-year-old comedian has more stories to tell than the standard ex- SNL -er's behind-the-scenes yarns. There was this crazy twist that happened in my life, and I thought maybe I should start writing about this, she says. 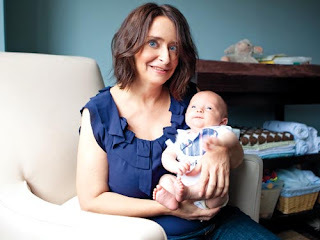 Dratch, at 43 years old, after having given up on the idea of being married with kids someday, unexpectedly got pregnant and decided to make that midlife miracle, as she calls it, the centerpiece of her book. Originally posted in April 2, 2012. -- Her career at a low point, Rachel Dratch suddenly had time for yoga, dog-sitting, learning Spanish - and dating. After all, what did a forty-something single woman living in New York have to lose?